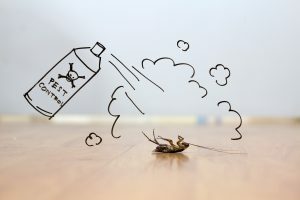 Many household pests are attracted by dirt – more specifically food waste – so a good way to keep bugs at bay is by blitzing the house with a new year super clean. While most people don’t relish the thought of cleaning the house, it is essential to maintain a certain standard of living. The key is to keep on top of things by getting into a few good daily habits – then making it a once-a-year mission to complete a ‘deep clean’. Kitchens hold a big attraction for household pests with all that food being stored, crumbs left on the floor, a water supply and the potential for damp. Use the new year to get rid of unwanted food and to wipe down the inside of cupboards used for storage. Make sure the cooker and microwave are spick and span and free of food debris then tackle the floor. Vacuum around corners, into crevices and behind bins to get rid of any dropped food then thoroughly mop the area. Use the opportunity to check the seals on your sinks are in good working order and will not allow access for any pests and fix any leaks – damp areas are havens for some pests. Carpets can be a great hiding pace for food crumbs and household pests. While the floors probably get vacuumed regularly this is the time to leave no stone unturned. Pull the furniture out, vacuum behind the TV and use attachments to target dust and mites that might be hiding out by skirting boards or on curtains. Like the kitchen, bathrooms have the potential to provide a damp haven for pests. Clear out under the sink and give every surface a thorough clean then double check for leaks or broken seals. No-one wants to think of bugs visiting their bedrooms so keeping the area scrupulously clean is the way forward. Sort out unwanted clothes and secure anything that will not be used for sometime in a sealed bag to avoid carpet beetles. Clear out under the bed and vacuum thoroughly then give the mattress the same treatment to send any undesirables on their way.